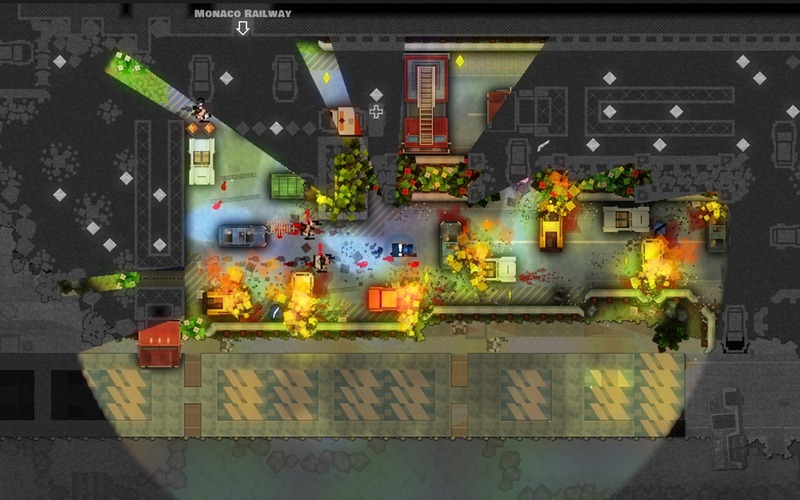 Monaco, as mentioned above, is a 2D overhead game that uses stealth and line-of-sight as key mechanics. You pick one of the different character types (cleaner, locksmith, lookout, etc.) and set out to take on various challenges ranging from breaking out of jail to rescuing other characters (who then become playable) to stealing treasure from under armed guard. The various characters have unique traits that lend themselves to playing differently. For example the cleaner – my personal favorite – can knock out guards if he catches them unaware from behind, while the pickpocket gets more loot and has a pet monkey. You can’t go wrong with a pet monkey. Back to our three-person play sessions, I’ll just regale you in one of our early adventures to help you better understand the game. The third level in the game is called Lebanese Embassy, whose name I badly misread when it was displayed. Jverde took the mole, Will took the lookout and I was the cleaner. The opening sequence gave us our first smoke bombs to play with before we attempted to infiltrate the building. We didn’t really talk about how we were getting in so we split up and tried various methods of entry. Our mole dug through the front wall while the lookout and cleaner went through an access shaft on the side of the building. Once inside, Will’s lookout walked straight through the first laser alarm we crossed and alerted the guards to our presence. Great. Rather than follow him into the building proper I stayed behind and turned off the laser (kind of pointless since it had just been tripped and I may as well have just crossed it). 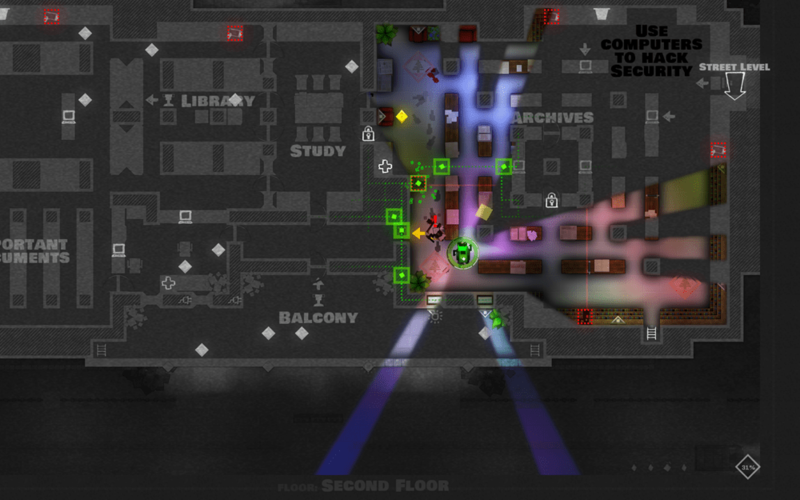 Mole Jverde was scouting around the center of the map (by digging through walls) as Will dodged guards left and right. I tried to knockout the guards but even if they weren’t on to me personally, they were still too alert to KO and my attempts quickly turned their attention my way. I eventually died in the meeting room north of where Will and I broke in but Jverde dug in to resurrect me. Will found the exit from this first floor and tripped another alarm or two running to it. Once on the second floor, I became the alarm-tripper. As Jverde tried to turn off the sequential laser alarms one by one, I got hasty and tripped one. The guards chased me in laps around the area as Will and Jverde tried to both peal them off of me and not get attacked themselves. On this floor, Will and I both died (but not at the same time) and we ultimately made a mad dash to the next floor, leaving a rather large group of angry guards behind. Hold on to this thought – it matters later. The third floor featured the prize we were after. Will scampered off for it while Jverde dug a circuitous route. I tried to slowly pick off the guards but again tipped one off and, to be honest, that’s all it takes to start the Benny Hill/Keystone Cops routine all over again. Really, the only thing missing during moments where all of the players are running past each other, dodging guards and yelling aloud to/at each other is a Yakety Sax soundtrack. It’s a cross between that and those Scooby Doo scenes where the characters run in and out of doors in a room full of them. It’s crazy, it’s chaotic, and restoring order is really difficult once mayhem breaks out. Back to our story, Jverde and I are dodging guards and finally make it into the room with the treasure but… there is no treasure. Will finally pipes up and says he grabbed it quite a while ago – he just wasn’t sure what to do with it. Jverde and I were a little stunned, to say the least. If we knew he had it we could have left by now. No time like the present, though, so we dash back down the stairs (we have to backtrack to get out) and reenter floor two and find the guards no less ticked off than we left them. Cue the music as we scramble for the stairs down to ground level. We make it to the first floor only to have all of us die at some point. We had been operating on very low health for a while by now, but since there was never a point where everyone was out at once we managed to get each other back on our feet and make it to the end. Monaco is a great group game for its ability to produce stories like the one above. Personally, I wouldn’t nearly enjoy playing it online nearly as much as I did playing it in old school “couch co-op” style. Soloing the game is a good tactical exercise and allot more methodical but again, get a few friends and a couple controllers and you’ll enjoy the game the most. The graphics look retro and primitive but there’s a ton of style on display here. 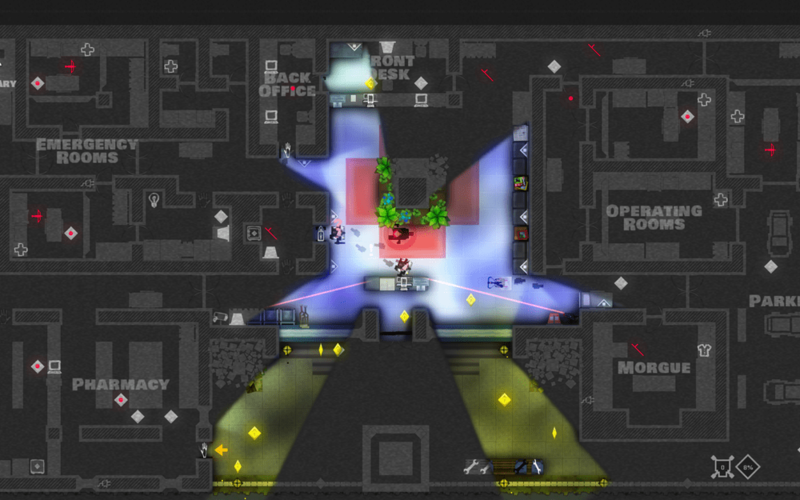 The neon look is very attractive and the line of sight mechanics are implemented beautifully. Rooms you can’t see are rendered as blueprints and rather than just light up a whole room as you enter it you’re restricted to what you have direct line of sight to. This means that pillars and jutting corners are a hazard to be either avoided or exploited – the guards use the same LOS system that you do. Lacking Yakety Sax, Monaco uses a simple but dynamic jazz score that plays mellow while you’re sneaking around but ratchets up in speed and intensity as the action ramps up. It’s a very clever use of music that enhances the game allot. I’d recommend Monaco to most anyone with some friends and free time. The only people I don’t think would really enjoy it would be strictly twitch gamers (because you need a steady hand at times) and people who would want to play online, particularly with strangers. This kind of co-op experience is becoming a lost art in gaming so don’t miss it.